In this sequel to Furthermore (2016), kindhearted Alice and friend Oliver travel from Ferenwood to wintery Whichwood with the assigned task of saving “a very strange” girl from a terrible fate. 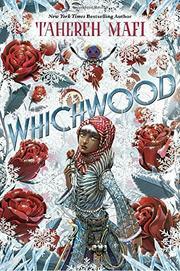 Since her mother’s death and her father’s departure, 13-year-old Laylee has become Whichwood’s only mordeshoor with magical skills to “wash and package the dead destined for the Otherwhere,” a ghastly, grueling, unappreciated task, sapping her body and soul. Watching her bronze skin, amber eyes, and chestnut hair turn silver, Laylee hopelessly realizes she’s “irrevocably ill.” Shocked and offended when Alice arrives suddenly and announces she’s come to “fix” Laylee’s “problem,” Laylee spurns her well-meaning visitors who try to help her launder the dead. When it becomes obvious that Laylee’s dying, Alice applies her own special magic in an effort to save her. Meanwhile, unattended ghosts of Whichwood’s dead avenge Laylee by wreaking havoc on the town, igniting terrible repercussions. Initially failing in her task, Alice eventually relies on her heart to “fix” her new friend. In deliciously descriptive prose, the confiding, familiar narrator directly engages the “dear reader” with witty asides, explanatory footnotes, and cautionary warnings as Laylee’s woeful tale unfolds. As she did in Furthermore, Mafi uses her built world to interrogate norms and relationships in our own while never losing sight of her story.